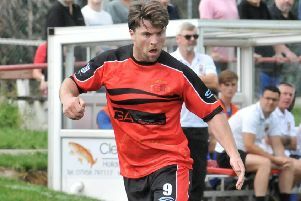 Darren Peacock will be back in the dugout when Lancaster City host Ossett Town on Saturday. The head coach has been struggling with illness and has missed the games against Scarborough Athletic, Salford City and Darlington with number two Trevor Sinclair deputising. Peacock however is set to handing out the orders again when the Yorkshire side visit Giant Axe. Sinclair said: “He’s back on his feet and feeling a lot better. “He’s had a virus and needed a bit of rest and relaxation. The final game without Peacock saw City slip to a 3-0 defeat at Darlington on Wednesday night with the hosts going top of the Evo-Stik First Division North. The Dolly Blues were 2-0 down inside the first quarter of an hour which left Sinclair frustrated. He said: “To say we didn’t start well is an understatement. “We had a good game plan but for some reason we stopped doing things that had brought us all our recent rewards. “After going down 2-0 so early on we showed some good resolve and on another day we could have got a goal and there could have been a different outcome. Sinclair went as far as to be self-critical following the defeat, admitting he could have shuffled the pack a bit as City played the final game of a run against the league’s top four sides. He said: “I put a little bit of the blame on myself. “We’ve had an unchanged team for the last few games but after the game I thought I maybe could have changed it to freshen it up. “A couple of the lads looked a bit leggy but beforehand I felt I couldn’t change a winning team.